We’ve visited Gulliver’s Land Theme Park in Milton Keynes a few times before. This is our first visit to Gulliver’s Kingdom Theme Park in Matlock Bath. 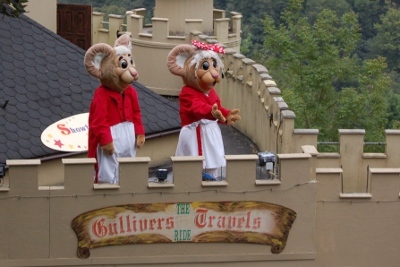 Gulliver’s is a Theme park designed for children aged 2 to 13. There is one adult roller coaster for older children and adults, but the majority are for younger children. My first impressions were not great. The toilets were very tatty and in desperate need of a refurbishment. We also went to a show which featured Animatronic bears. The show was dated and our children did not enjoy it so we walked out part way through. Fortunately the theme park improved after these first impressions. The park is located on a steep hillside. Despite this there are ramps and paths around the site and it’s not too difficult to negotiate with a pushchair (it may help you get fit though). There is also a cable chair lift, we did go on the chair lift, but we did not take our youngest (under 2) or the pushchair when we went on. There is a good selection of rides. Our daughter’s favourites were the logflume, roller-coaster (children’s sized) and shooting gallery type ride. There were also some rides for younger children including ladybirds, carousel and gentle boat ride. Apart from the very small rides children need to be accompanied typically if they are below 1.2m. Our daughter had certainly been on similar rides at other places without needing to be accompanied, at least it gives adults a chance to ride as well :-), but the ladybird ride was a bit small to require an adult. 15 minutes were told that the sign was wrong and young children were not allowed on the ride. Fortunately I was still able to take our older daughter on the ride, but this could have been very frustrating for some people and could easily be fixed my changing the sign at the entrance. We visited out-of-season and there were very few queues around the park, this was one of the few rides we had to queue more than once around for. 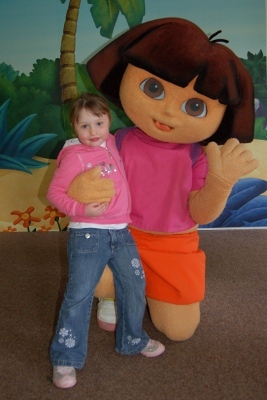 The Gulliver’s Theme Parks have Dora The Explorer and Diego character appearances during 2009. These are better known (and arguably more popular) characters than the Underground Ernie character that was at Gulliver’s Theme park during 2007. There were opportunities to meet Dora and Diego either separately or together depend upon the session. We didn’t see anything advertising the time or location of the meet and greet, but fortunately happened to be walking past at one of the sessions (Diego) and was then told the times when Dora would be around. There is Dora the Explorer theme throughout the park. There was a task for children to perform various activities and in return get a card stamped. After getting all the stamps the card could be swapped for a Gulliver’s Medal. The activities couldn’t be deciphered in most cases (broken speakers), but it was still possible to get all the stamps. Despite the challenge part not working, our daughter loved this part of the part, she enjoyed collecting the stamps and the achievement of getting the medal at the end. The Gulliver’s Kingdom theme park at Milton Keynes is the oldest of the Gulliver’s theme parks and is showing it’s age in some places. It could certainly do with some refurbishment in some areas. The park is not quite as good as the Gulliver Land Theme Park, but is still well worth a visit. A great day out and thoroughly enjoyed by our kids. More days-out with children and babies. This entry was posted on Saturday, September 19th, 2009 and is filed under Babies, Children, General, Tourism. You can follow any responses to this entry through the RSS 2.0 feed. Both comments and pings are currently closed.